SUMMARY: Duncan is a 3 on a scale of 1 to 10. At least that’s what his Mom’s new boyfriend thinks, but that’s before Duncan spends the summer discovering who he really is. DETAILS: Duncan’s Mom has a new boyfriend (Steve Carell) who owns a house at the beach and Duncan (Liam James) will unwillingly spend the summer there… and in the process he will become himself. The beach community is “like Spring Break for adults” where the parents party every night and Duncan and his neighbor Susanna (AnnaSophia Robb) are left to while the summer away. Soon Duncan sneaks off to Water Wizz, the local water park where he finds purpose and a father figure (Sam Rockwell) who cares for him and helps him realize he has value and self-worth. 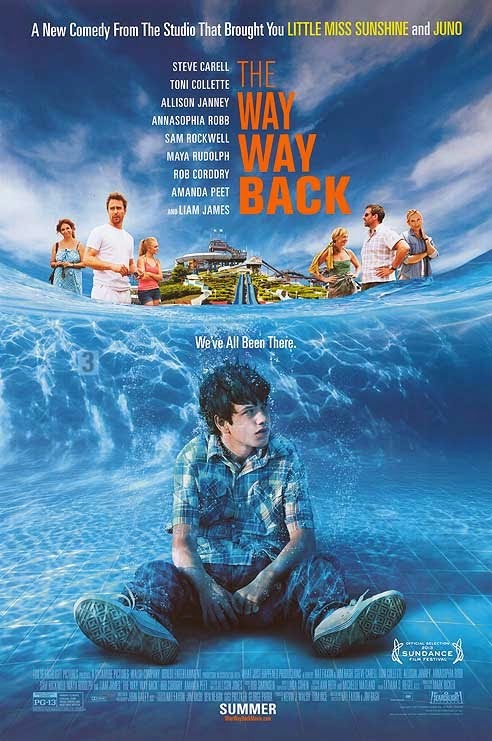 The Way, Way Back is a fun, funny, and painful reminder of those awkward years transitioning from childhood to adulthood. The film has a great vibe and the cast does a fantastic job telling this story of a boy coming of age.